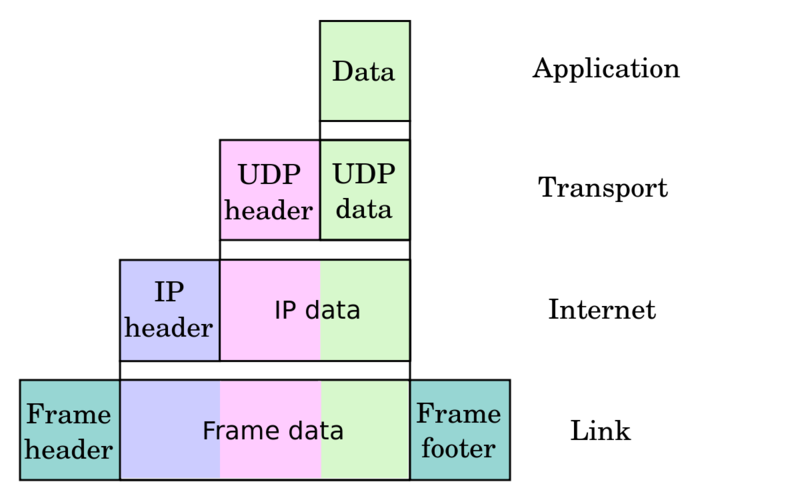 What are the differences in the contents of datagrams, frames, and network packets? I'm reviewing the networking security unit of the class I'm in, and I had a question. I know that datagrams are packets at the transport layer of the OSI model, whilst frames are the name for packets in the transport layer and network packets are in the network layer. I also know that each contains a header with overhead info like the source and destination IP addresses, as well as a payload of data. But I wasn't able to find anything about the subtler differences between the contents of datagrams, frames, and network packets. Are there any resources or diagrams you could point me to so I can further my understanding of these concepts? A self-contained, independent entity of data carrying sufficient information to be routed from the source to the destination computer without reliance on earlier exchanges between this source and destination computer and the transporting network. and can be used to speak about any layer transmission unit. the frame is the network access layer datagram. the application data receives a transport protocol header (UDP or TCP generally) and become a segment. The terms Frame, Packet, and Segment exist to create abstractions from what one layer is responsible for verses the others. To explain that, and to answer your question thoroughly, I'm going to start a bit "earlier" than what you are really asking. When Layer 4 gets data, it adds to it a header which facilitates service to service delivery like TCP or UDP ports (among other things) -- this whole datagram is referred to as a Segment. When Layer 3 gets data, it adds to it a header which facilitates end to end delivery like the source IP of the initial sender and the destination IP of the final recipient -- this whole datagram is referred to as a Packet. When Layer 2 gets data, it adds to it a header which facilitates hop to hop delivery like the Source and Destination MAC addresses of the current "hop" in the network -- this whole datagram is referred to as a Frame. You and I know that inside the frame is a L3 header and a L4 header and application data, but as far as L2 is concerned, everything inside is just a series of 1s and 0s that need to be delivered to another hop. And the application data itself, of course, is going to differ with every application. HTTP for web requests, FTP for file transfers, and so on. The term Datagram itself is simply the construct of a header and bits. And the terms above are simply the unique names for the particular Datagram that operates at each layer. What are the minimum requirements to be on the internet? How are collective networks connected to eachother for the creation of the Internet? Are there any global network other than the Internet?